Market editor Cat Dash's dining room revamp; a set of Calvin Klein candlesticks sits on a Loom Decor striped runner. 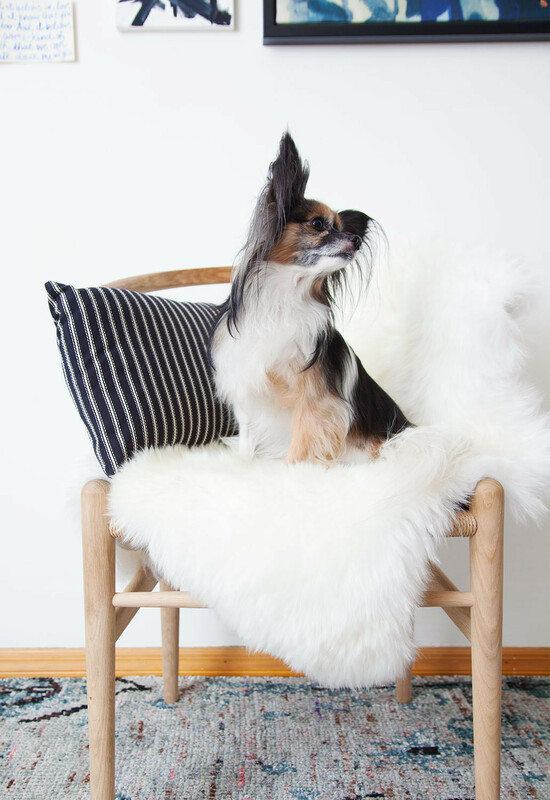 Dash's nine-year-old papillon Lulu Dash-Mapes gets comfortable on a shearling-topped Hans Wegner Wishbone chair. In the months leading up to our 2013 nuptials, my husband, A.J., and I used to joke about how we still felt like kids. A wedding seemed like an impossibly grownup step—one that we were both excited, if the tiniest bit hesitant, to take. Fast-forward to a year later: we’re happily married and comfortably settled in our nesting phase. Though we’ve lived together in the same Williamsburg, Brooklyn, apartment for five years, a few months ago we decided that the space needed an upgrade worthy of all of the growing up we’ve done. After all, having friends over for a dinner set around the coffee table wasn’t going to fly anymore, and we both spend more time working on our laptops than in front of the television. So we set our sights on converting a little-used space off the kitchen—unofficially known as A.J.’s office (read: dude cave)—into a multi-purpose room for both work and entertaining. Our makeover project began with a realization: an oddly shaped nook on one side of the room wasn’t living up to its potential. 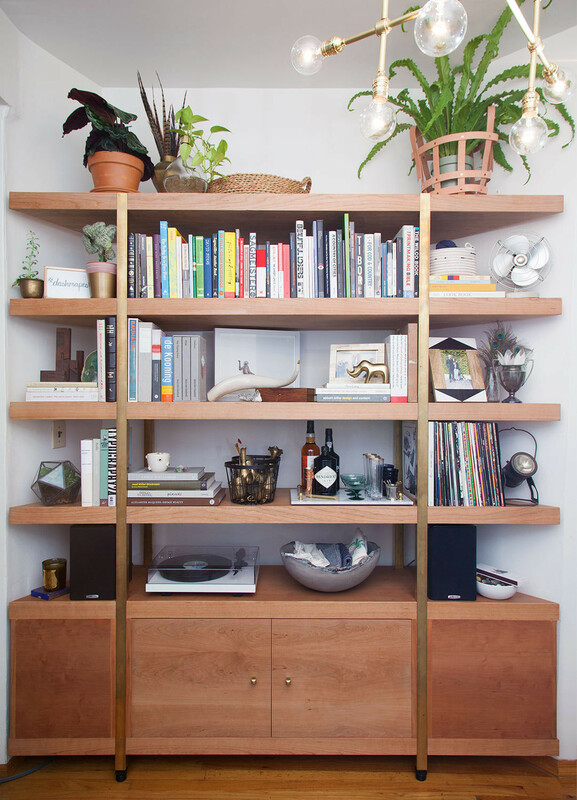 To solve the problem, we called on the masterminds at the Brooklyn custom furniture design company Pink Sparrow Scenic to create a shelving unit that would fit the space’s asymmetrical angles and height. Made of cherry wood with brass metalwork, the piece now houses everything from personal items such as A.J.’s record collection to newer additions, including byAMT’s leather-strap planter, H&M’s metal storage baskets, a coral cactus from Costa Farms, West Elm’s agate book end, and a Nate Berkus frame. Aesthetically pleasing as it is, putting everything in its place also opened up the rest of the room for West Elm’s Midcentury dining table with seating for six. Uniting it all is and ikat-patterned hand-knotted wool rug from World Market, which lends a boho element to the dominant midcentury theme. Above: Dash with her new gallery wall. 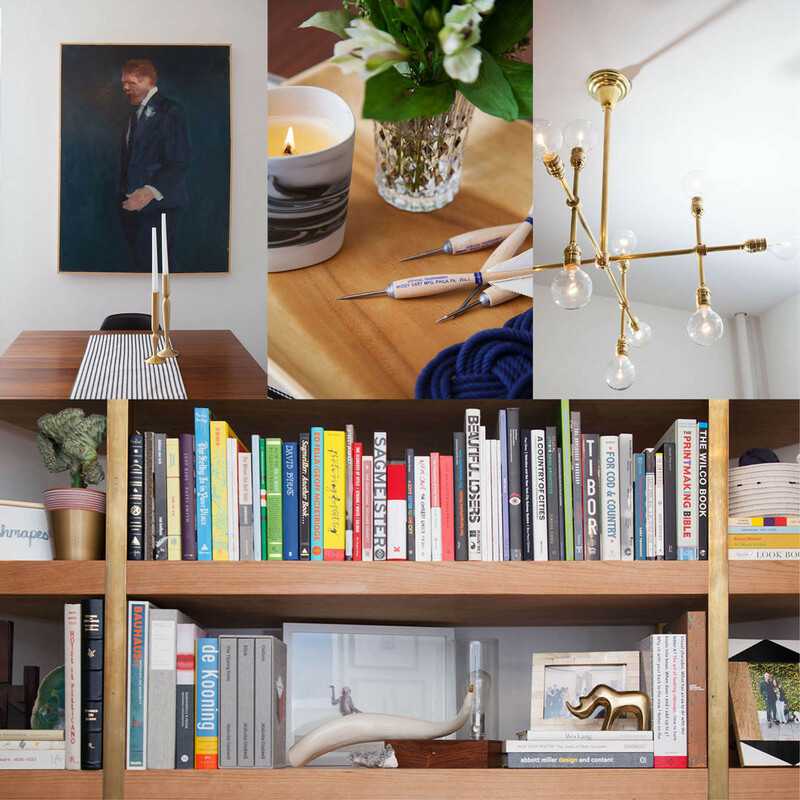 Left: Custom shelving is decked out with personal items, including Dash's husband's record collection, a mini bar displayed on Katy Skelton's marble-and-brass Admiral's tray, and Calvin Klein's new Artisan Collection ashen oak bowl filled with assorted table linens. On the wall opposite our new furniture piece is the room’s pièce de résistance: a gallery wall inspired by Julia Leach’s unforgettable take on the concept. To pull it together, I reached out to Dara Deshe at Simply Framed, who consulted with me on every detail of the project, from a video chat focused on choosing framing styles (considering both the individual pieces and the wall as a whole) to how best to hang the wall once my framed artwork arrived. Favorite pieces include Sara Singh’s Trigger print for Stampa; St. Frank’s Diddew Noir mini framed textile; Woven Laine’s wall hanging; Zoe Bios Creative’s Francis 5 painting; and Francis Sousa’s Untitled. A smaller perpendicular wall became the perfect place to showcase a large-scale oil painting and prized possession by the Brooklyn-based painter William Logan. With the bigger components in place, we concentrated on the details. To keep an unstuffy, laid-back vibe, we chose an assortment of chairs, including the classic Eames molded plastic chair, Hans Wegner’s Wishbone chair by Carl Hansen & Son (possibly the most stylish-yet-ergonomic chair ever), and a pair of gray Windsor chairs by Target’s Threshold label. 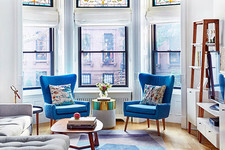 I layered seating with Ugg Home shearling throws and boudoir-size pillows by Loom Decor for a cozy, lived-in aesthetic. I completed the scene with a simple striped table runner under a pair of Calvin Klein’s gold candlesticks, plus Mystic Knotwork's rope coasters and a wood tray holding Diptyque Paris’s Le Redouté candle. 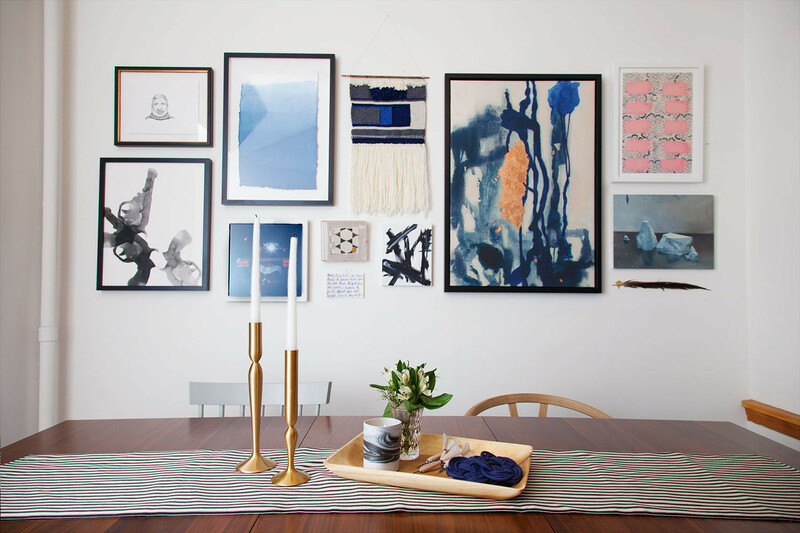 Clockwise, from top left: Brooklyn-based artist William Logan's painting hangs above the dining table. A wood tray holds knotted-rope coasters and a Diptyque candle. A custom brass chandelier. Shelving by Pink Sparrow Scenic houses the couple's assorted personal items. The final piece in the puzzle, which elevated my humble rental in a much more drastic way than I could have imagined, was a 12-arm brass light fixture custom made by Paul D. Pisanelli for New York Vintage Lighting to fit my exact measurements. 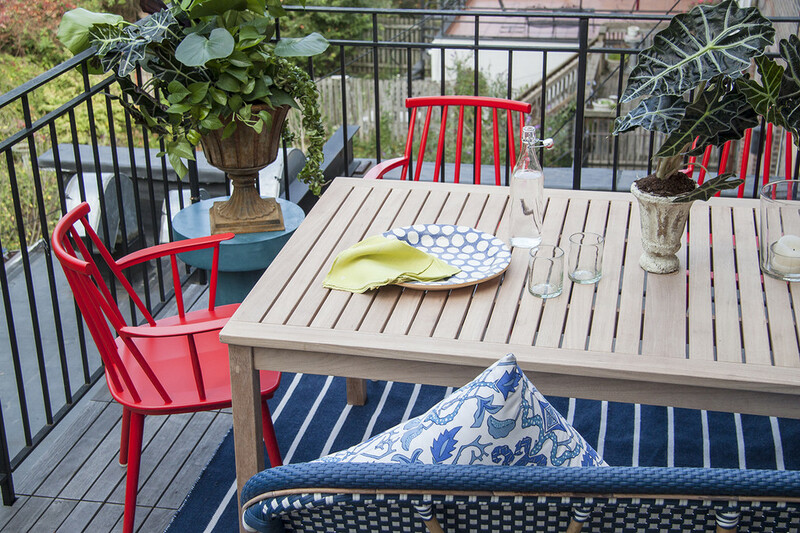 After spotting a similar version at Octavia & Brown’s NYC showroom, I begged owner Liz Geddes to share his info, and I couldn’t be happier with the results. Here’s to the luxury of finally having a grown up dining room—better late than never! 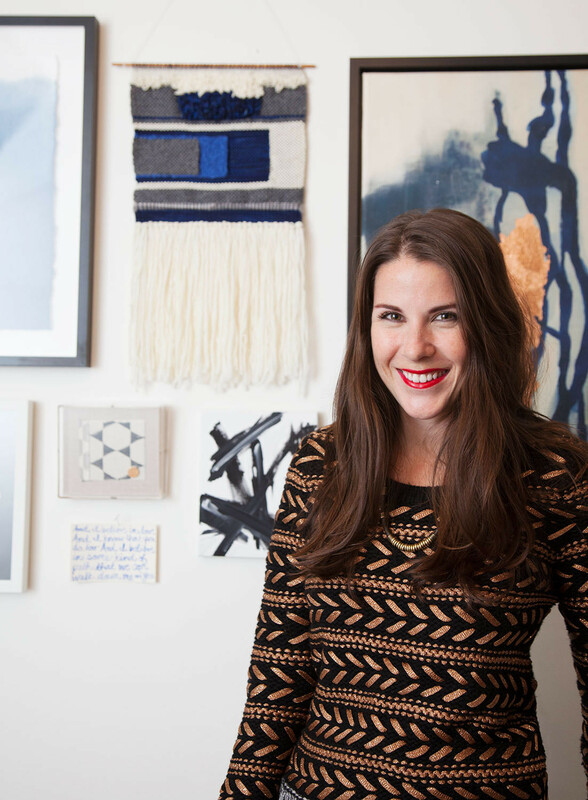 Lonny's Genevieve Garruppo creates a room to satisfy the aesthetic demands of a motley crew. 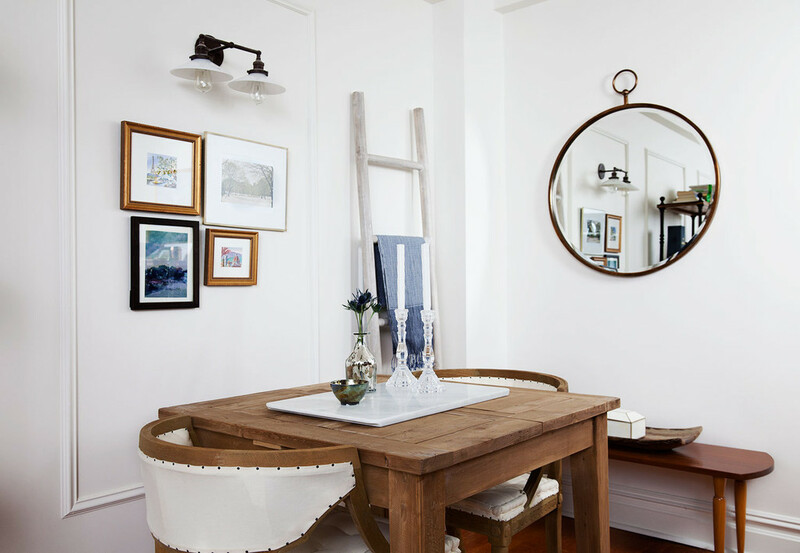 Lonny’s Jennifer Fernandez transforms a Brooklyn one-bedroom into a cozy haven filled with classic touches. 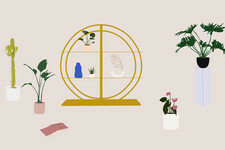 Graphic Designer Natalie Caceres turns a no-frills room into a polished retreat that's as timeless as it is fun.